Hurricanes are tropical cyclones. They are categorized by their wind speeds and size starting around 74 mph. They bring strong winds (obviously), sometimes rain, storm surge tides, strong waves, flooding, and strong currents. All things that can be hazardous to your boat. As Hurricane Florence approaches the east coast, we’d like to take some time to share a few “Nautical Solutions” (HA! see what I did there?) to keep your vessel safe during a storm! My parents have had a boat for longer than I’ve been alive and growing up in a NJ coastal town, you get to know the drill pretty well! Also, we got to experienc Hurricane Lane in Hawaii this year too! YAY! lol Enjoy! If possible, TAKE YOUR BOAT OUT OF THE WATER!! The safest place for your small boat during a hurricane is on a trailer, in an area that is NOT prone to flooding and away from any trees that could drop large branches or fall and damage your vessel. Large parking lots are a good choice but PLEASE make sure that you remember to TIE THE BOAT TO THE TRAILER! There’s nothing worse than coming to check on your boat after the storm, and the strong winds have knocked it off the trailer. If you boat is on a trailer, make sure to take out all of the drain plugs so that excess rain doesn’t settle in your hull. Also, make sure that your cabin is sealed so that water can’t get inside. Larger boats that cannot be taken out of the water should be taken up river, or up stream where there will be less wave activity. The wind waves alone could damage your boat on the dock, or damage your dock. Extra large boats may want to consider riding out the storm in the open ocean. 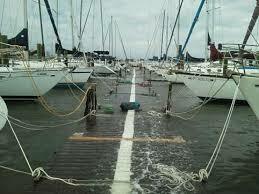 If you have a big port or yacht marina near you, you may notice a line of boats going out to sea. That’s because they are too big to take to a protected area, and they are too heavy, not to damage the dock when large waves invade the marina. Consult a licensed USCG Captain before trying this yourself. If your keeping you boat in the water install an EXTRA bilge pump - I can’t tell you how many times I’ve gone to a marina to check on boats in a rain storm only to find half of them are sinking because the bilge couldn’t keep up with the water, it burned itself out constantly running, or the battery died from the bilge pump running nonstop. Make sure you boat will be there after the storm with extra dock lines! Get extra dock lines and duplicate each line that you use to tie the boat to the dock… i.e. There should be 2 dock lines to every attachment point from boat to dock. Factor in extra-high tides when setting the length for your dock lines. The boat may need a little extra wiggle room to avoid excess load on your lines. You can use a tide prediction chart to find out the expectations for the tide heights. Remove ALL canvases and plastic windows, called isinglass, that are at risk for wind damage! If they aren’t essential, take them off! While your at it, take off (or put in the cabin) any cushions, fishing poles, nets, or electronics as well! Keep your vessel registration and HIN with you. If your boat is lost (which happens) you may need to have that information to collect it. While your at it, please make sure all of your registration stickers are up to date on your boat! If something happens, you don’t want a ticket on top of that. Remove your dock box from the dock, if possible. Flooding, wind, waves … you don’t want to loose it, or have it end up in the water damaging your boat. Lose boats are most likely the #1 cause of damage storms. The only thing left to do is to prepare the wine and food supply for your storm party! It’s always fun to wait out the storm, especially when you know you don’t have to worry about your boat! Do you have any other tips and trick for storm preparation? Share them in the comments below!